The exclusive or/exclusive disjunction (symbolized by the infix operator XOR), is a connective in logic operations that yields true only when one (but not both) of the inputs/conditions is true. Sometimes expressed as “one or the other but not both”, the XOR operation can be written as “A or B, but not, A and B”. 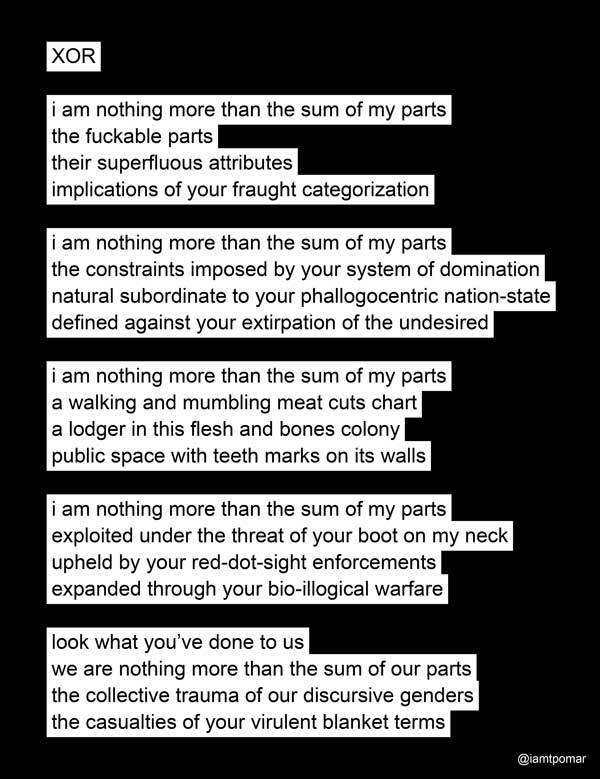 This logical operator informed the sentiment in my poem, ‘XOR’ which explores the presumed logical impossibility of non-binary genders/genderqueerness and the prescribed notion of “male or female, but not, male and female, nor not-male and not-female”. ‘XOR’ features in this year’s TQ Review: A Journal of Trans and Queer Voices (Petersburg, VA: July 2017).